Many visitors to Cape Tribulation will leave shaking their heads in amazement after having met one of the more fascinating inhabitants of the rainforest - a flying fox. As rainforest ambassadors, they are unrivalled - friendly, intelligent and definitely with personality plus. The Bat House is so named because there is always a flying fox in attendance. These primates are mostly orphans, which for one reason or another have been in captivity too long to be allowed to enter the wild, which must usually occur no later than 6 months after birth. As part of our Cooperative Management Agreement with the Wet Tropics Management Authority, the Bat House has become an accredited Wet Tropics Visitor Centre. Many visitors to Cape Tribulation will leave shaking their heads in amazement after having met one of the more fascinating inhabitants of the rainforest - a flying fox. As rainforest ambassadors, they are unrivalled - friendly, intelligent and definitely with personality plus. They are great show-stoppers and crowd pleasers, and great for getting visitors to start asking questions about the rainforests (as well as losing their fear of bats). Entrance to the Bat House is by a $5.00 (AU) entry fee (cheaper than a beer and a lot more interesting!). Proceeds from the Bat House fund the research activities of the Cape Tribulation Tropical Research Station, feed the resident fox colony and help the yearly rescue of spectacled flying foxes, orphaned through tick paralysis, in areas of the Atherton Tableland to the west of Cairns. We also sell books, T-shirts, batty stuff and local memorabilia. All Bat House staff are volunteers. 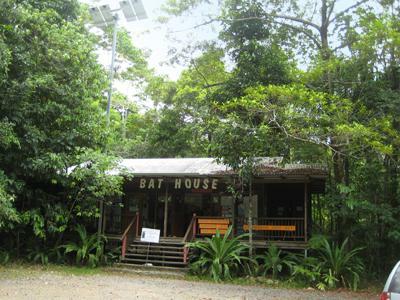 Besides giving visitors the opportunity to meet a flying fox, the Bat House provides environmental and tourist information on the region, and the research activities of the Station are highlighted. Prior to the Bat House being built in 1991, the land around it had been cleared for grazing and orchards by previous owners. An intensive re-vegetation and replanting effort was put in place and the land is vastly recovered. The building is a passive solar design, and operating power is provided by a bank of solar collectors on the roof. The toilets are compost systems (Maxi-Rotaloo), which get fairly heavy use as public toilets (no breakdowns) are non-odiferous and use no water.